Where I come from, autumn is a very colorful season with hillsides in gold, orange, brown, and green. With that as inspiration...the latest releases at ELEMENTAL JEWELRY are the Falling Leaves Necklace, Earrings, and Bracelet--perfect for your seasonal attire. 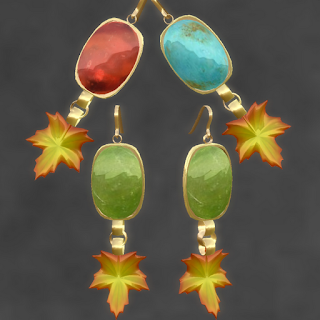 The necklace and bracelet are resizable, and the stones are texture changing--in Red Garnet, Green Garnet, and Turquoise. Each are sold separately, and they are all on sale this weekend! The bracelet is only L$30, and the necklace & earrings are in the L$60 Weekend Sale for L$60 each. Hair: WAKA & Yuki New 01 Pack C--in the sale section. Skin: Mamboo Chic Anka--a recent gift from MC's Lucky Board. Dress: Ivalde Maisie moss green--gift from the Witch Hunt 2011.